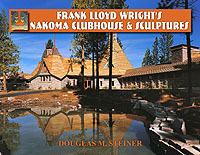 As I began studying and collecting books about Frank Lloyd Wright, I was overwhelmed by the number of books, articles and pamphlets I came across that were written by and about him. Somewhere along the way I kept running across a numbering system that peaked my curiosity. Sweeney # this and Sweeney # that. I finally accepted my ignorance and asked what they were referring to. I found out about Robert Sweeney's "Annotated Bibliography". Mr. Sweeney was able to verify nearly 2100 different books and publications up though 1977. It is "The Gold Standard" for collecting. There is a new book that continues where Sweeney left off, and picks up a few he missed: "Frank Lloyd Wright : A Bio-Bibliography" by Donald Langmead. Architectural Forum Architectural Lighting Architectural Progress Architectural Record Architectural Review Architecture Architecture N.J.
Do you have any Wright items to sell? Please contact us!